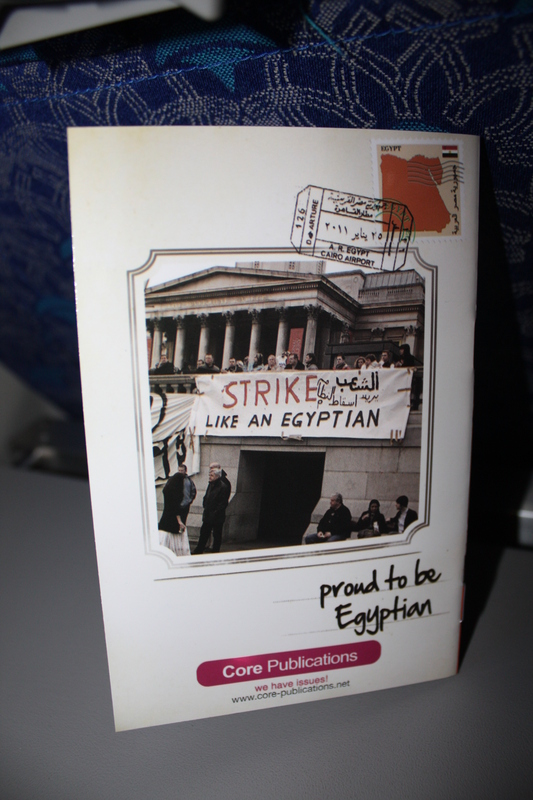 This is the first of many rants from my private journal on my trip to Egypt last year. Learn more about the series here. Baba and I landed in Cairo on the evening of May 19, 2011. Baba’s requested wheelchair service was waiting for him right outside the airplane door, not the gate door like in Germany (for our layover), the airplane door which put my overly anxious father at ease. To be honest, the gentleman had an extremely professional and friendly demeanor unlike what I was expecting. He guided us through customs, “this way please”, where the officers were oddly polite following typical procedures with their questions. Then he guided us to baggage claims, “this way please,” where I remembered the one bag that wouldn’t show up. I was maybe on 3 hours of sleep, exhausted from packing and repacking thanks to the odd agreement amongst airlines that believes you are well off on a long international trip with about 100 pounds and one carry-on. (To the people that come up with these stupid standards, good shoes and toiletries are not light!) I’ve been packing for over a month and somehow until the last minute I was still off by several pounds. The best part, I wasn’t just stressing over packing for myself, it started with stressing over shopping and packing for Baba too! At SFO, there was a good 20 minutes of misinformation because Lufthansa was convinced I was going to Europe and not the Middle East so I should have LESS luggage… WHAT?! After that, was another good banter over one of my carry-ons being one too many. Really? Lufthansa asked for $250 if I wanted to have it checked! In the end I had to part with it because I usually take a while to get through security because of my hijab and Baba wasn’t being helpful at all. It was a tough decision to have to leave it behind even as Mama said she’d ship it too me. All I could think about was my favorite pair of heels I had packed in that carry-on specifically so they don’t get messed up in the handling of my luggage (I know, first world problems). For those who may or may not know, despite my ungirly dislike for shopping, I have a thing for shoes! Back at the new terminal of Cairo International Airport (seems its only for EgyptAir flights), the gentleman handling my father’s wheelchair was kind enough to help out with our luggage, let me use his cell phone when my T-mobile international roaming decided not to be turned on per my request weeks in advance and wait before Baba’s nephews were able to get through security outside the airport to receive us. The last time I was here was April 2001. I had an interesting experience, both good and bad. I enjoyed meeting new people and exploring Egypt’s treasures while putting up with constant verbal cat calling at the presence of my family members in public. I wondered then if Egypt would ever improve, change for the better. I didn’t have a great first impression when after landing in Cairo’s airport then, everyone was harassing Mama and I to handle our luggage and be tipped for just offering to help. Customs were rude, acting like they were doing us a favor by letting us enter the country. Employees were plain rude if you weren’t deemed “important” or refused to tip for no reason. Bombarded by drivers fighting over offering you a ride even after you’ve said you were not interested. No one touched our luggage unless we specifically requested it. Drivers only asked once, politely, and wished us well as they flashed a smile after we said “no, thank you.” The gentleman handling Baba’s wheelchair was a married man with kids, working this job because he actually enjoyed it. He didn’t once mention anything about getting a tip. Baba and I of course insisted on tipping him and taking down his number so that we can connect with him when my father was to fly back to California alone two months later. On the hour or so drive to Baba’s farming country town of ElManzala where he grew up, I wondered if that airport experience was enough of an impression to judge if Egypt has changed for the better, different after the great revolution of earlier that year. Some streets were clean, others were not. Drivers were still driving crazy at one in the morning, yet they used their turning singnals. Homes were still being built, clothes were hung on clothes lines across balconies and roofs. Mosques and churches alike were colorfully light up. Cairo was wide awake, it never slept. And not one picture to remind the people of who used to run this place. Interesting how a decade can change a country. I’m interested to know if the change in process at the airports happened recently or gradually over time.